A sad reality bites: when you become a senior citizen, you can still encounter problems. Unfortunately, the dilemmas adults face will continue to haunt them even though they are shaky, wrinkly, and gray-haired. For senior citizens, having problems is no longer new. However, having too much of these problems at once is very unhealthy. Presented by this reality, how can you help a senior citizen? Though there are many possible solutions, there is one that is easy, fast, and most of all, free – talking. Stress, biologically speaking, is a condition that keeps us alive and alert. However, when too much stress is carried by one, it creates health risks. For senior citizens, being too stressed brings them closer to hypertension, cancer, diabetes, and the like. When you think something is wrong and you still cannot figure things out, ask them instead. Talking is a perusing yet diplomatic communication means. When used appropriately, you may be able to see what went wrong and how things can be mended. When you talk with your grandpa or grandma, they somehow pick new information. Though most people their age enjoy and prefer newspaper as a source of viable information, there are things that are not printed on those papers. Information acquired when conversing with someone creates a deeper impact in the human mind. Depression is a mental disorder that is a no laughing matter. Being already dangerous with the youngsters, this condition is twice as grave for the elderly. Brought by mixed conditions and stormy change of moods, depression can easily reside at the back of a senior citizens’ mind. Feelings are meant to be shared, not kept. Fortunately so, as humans we have the faculty of talking to express our minds and what we truly feel. For seniors, they need to be told “I love you” and “Thank you” often. Choose your words carefully and allow the same to strengthen your ties with them. Got some unsettled score with an elderly loved one? Reconnect with them by talking your differences over a cup of tea. State your apologies and be the one to adjust. Do not let any misunderstanding last beyond their near passing. Time is an absolute and irreplaceable resource. 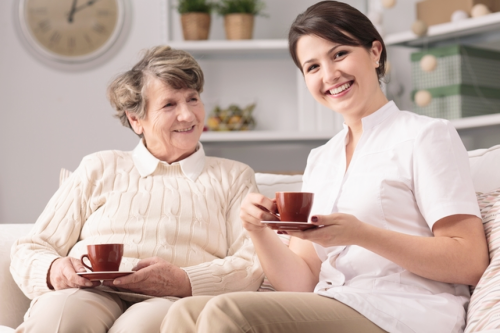 When finding enough time to care for your senior loved ones is already difficult, do not fret, Ontime Home Health Care Staffing Agency LLC is here to help! We have polished our services to become the best Health Care Agency in Ohio, if not the entire America. Questions about our services? You are free to call us at 440-353-1012. Wondering if there is a provider of Personal Care Services in Cleveland, Ohio that can satisfy your high standards? We might be the team you are longing for! This entry was posted in Health Care and tagged Home Health, Home Health Care, Home Health Care Service, Ontime Home Health Care, Why Talking to a Senior Citizen Helps. Bookmark the permalink.